This post is about cake. 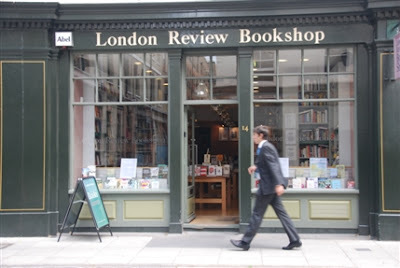 So if you're looking for something about LRB, you've clicked on the wrong link. Sorry. When I was a freshman first-year at MHC, Professor Hill returned my first paper to me in his infamous Medieval to Commonwealth class (where the weak are weeded out on the first day and the strong are commended for their bravery, etc.) with a bunch of illegible scribbles (as he does) and a not-so-decent grade. When I queried this not-so-decent grade, he instructed me to, "Read the London Review of Books. That'll improve your writing style." So I'm sure he'll be proud to know that nine years later, I found myself having lunch in the London Review Cake Shop (which is attached to the London Review Bookshop), eating a lovely slice of quince tart with creme fraiche for dessert, sipping on a chocolate sprinkled cappuccino and thinking of nothing related to the LRB at all. I met Iain at this tiny (and I mean tiny) cake shop for lunch yesterday with a growling stomach and didn't care that there were only about 4 items on the chalkboard menu: quiche with accompanying salad, soup of the day, salmon and cucumber baguette or egg mayonnaise sandwich. "You don't have much choice here, do you?" asked a disdainful woman of the waitress when her fussy boyfriend complained of his partner's lunchtime selection (apparently he "doesn't eat sandwiches, hates quiche and is allergic to barley"). They left shortly. I, however, was enamored by the charming menu of limited selection and opted for the egg mayonnaise sandwich, which came on homemade granary bread with rocket, sliced black olives, sundried tomatoes and a thin layer of mustard (I know, I'd never think of putting those six things together either, but it totally worked). Iain had the salmon baguette, which was simple but apparently, "really good". We finished off with slices of the quince tart topped with almonds (so think bakewell tart here, people) and flourless chocolate cake. I can't think of a better way to spend your lunch hour (that is, if you can get a seat). And afterward, if you have time, you can even browse the books next door - if you're so inclined, that is. If you're like me, you'll just eat your cake and run.